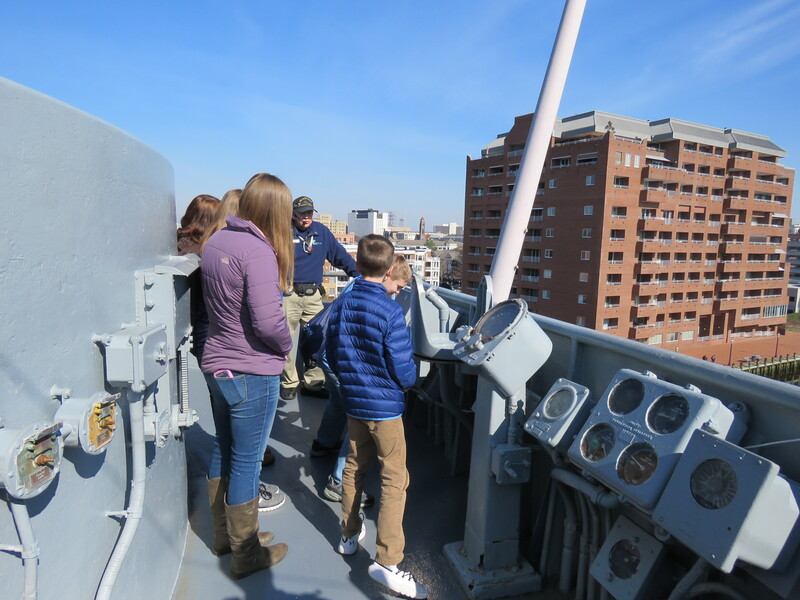 Yesterday (February 2, 2019) we took our family to visit the Battleship Wisconsin (BB-64) who is berthed at Nauticus, in Norfolk, Virginia at the largest navel base in the world. 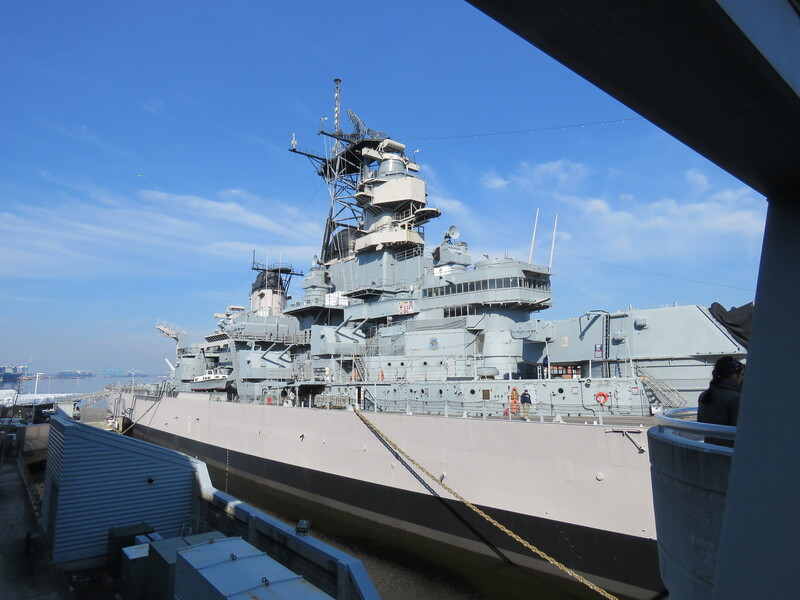 It was fun, educational and very interesting to visit this majestic battleship who, in her day, was queen of the ocean. 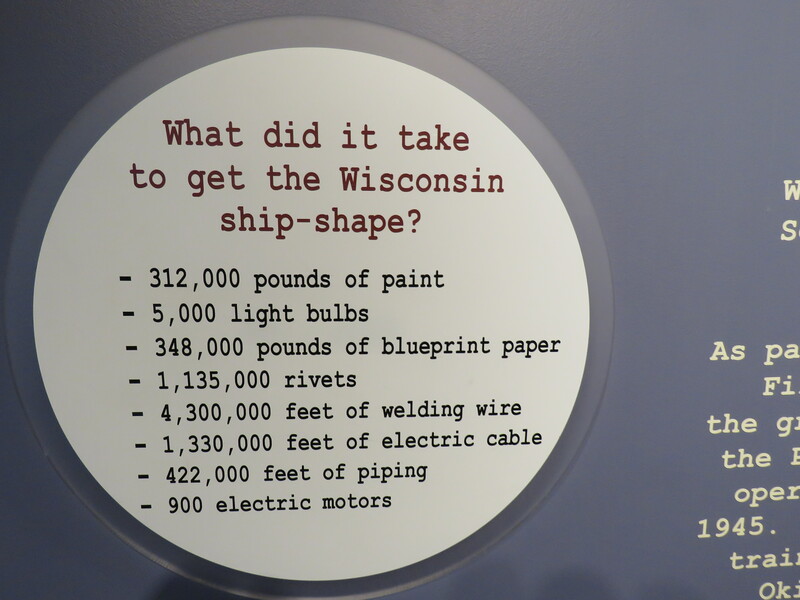 The Wisconsin, affectionately nicknamed “Big Whisky,” is 887 feet, 3 inches in length and 108 feet, 3 inches at the beam and could reach speeds of 33 knots. Her crew complement was 1,921 officers and enlisted men. 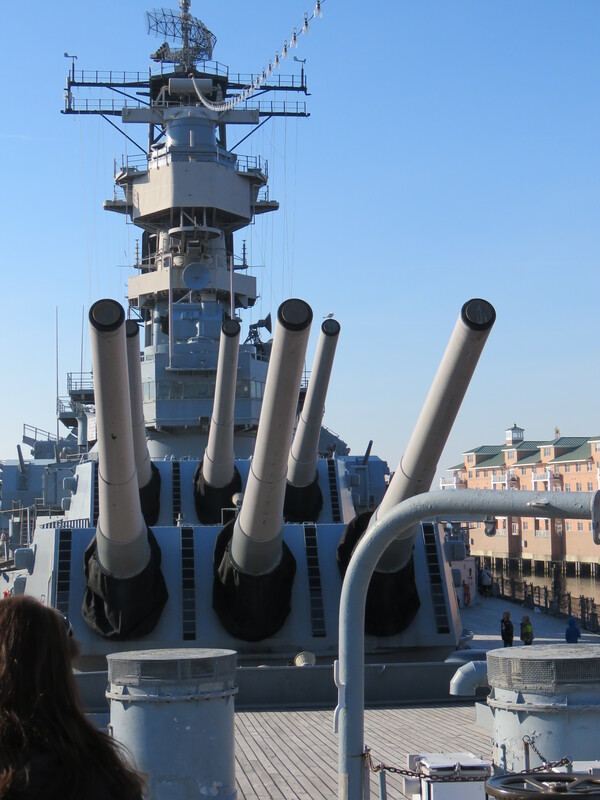 Despite its mammoth proportions, the Japanese had three battleships that dwarfed the Wisconsin. This ship was actually the second ship so named. The first was called the BB-9 and was decommissioned in 1920 after over two decades of service. 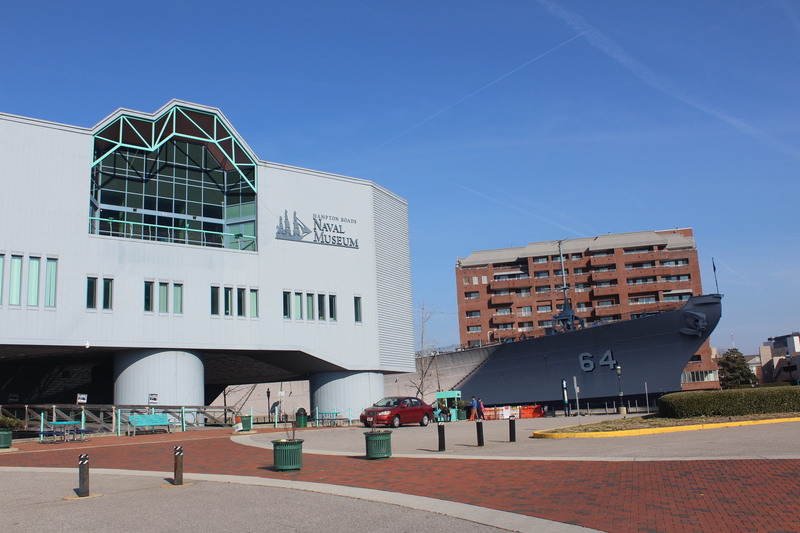 The second Wisconsin was built at the Philadelphia Navy Yard in 1941 and launched on December 7, 1943, the second anniversary of Pearl Harbor. 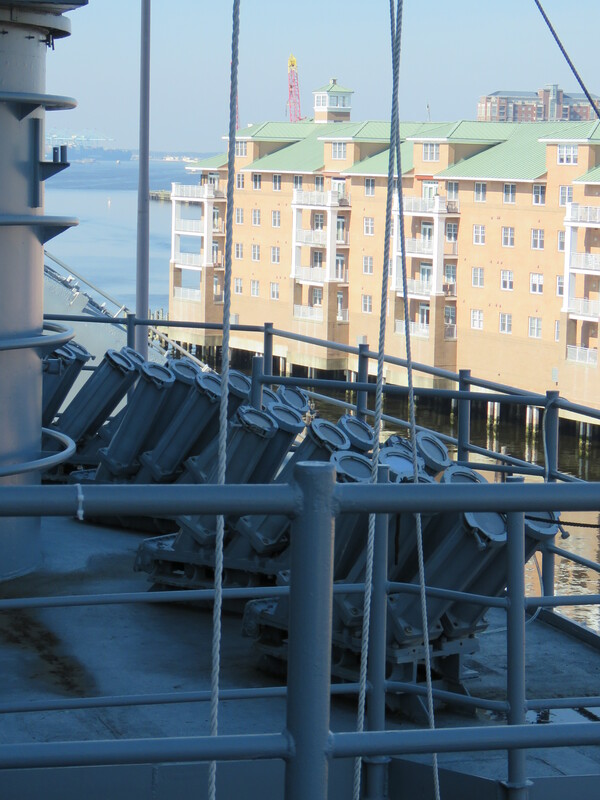 Battleships are no longer used by the navy and have been replaced with Air Carriers and Destroyers. Big Wisky enjoyed a service that spanned six decades, surviving two typhoons and participated in three major wars: World War II, Korean War, and Operation Desert Storm where she fired the last shot of the war. In 1991, least than a month after returning from Desert Storm, she was decommissioned and relieved of active duty. 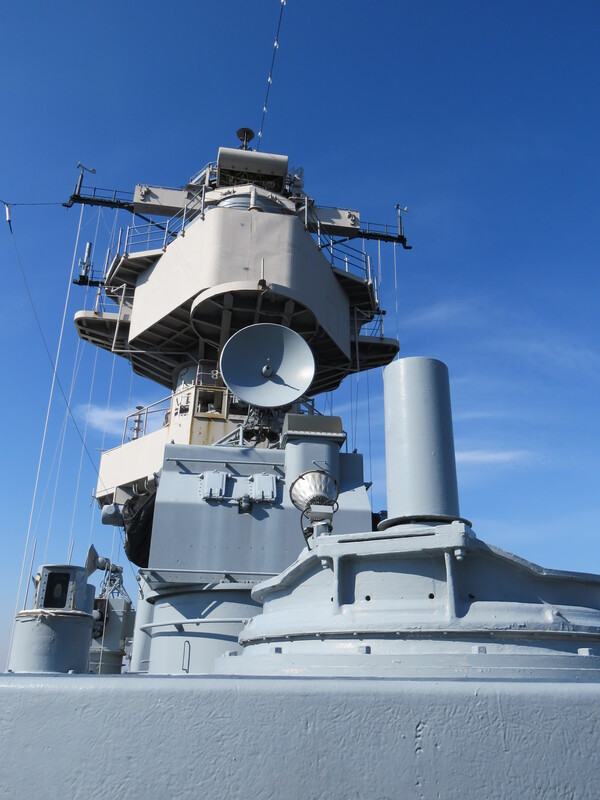 In 2006, the US Navy deleted the Wisconsin and Iowa battleships from the NVR and made arrangements for the battleships to be donated to a museum. 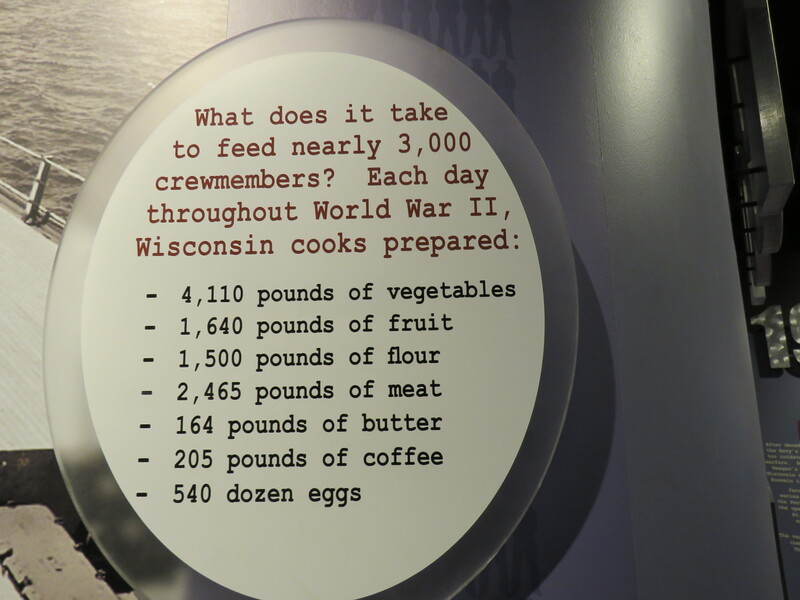 The United States Congress was very concerned about the loss of battleship firepower and stipulated that the Wisconsin had to be maintained “battle-ready” for deployment if needed. 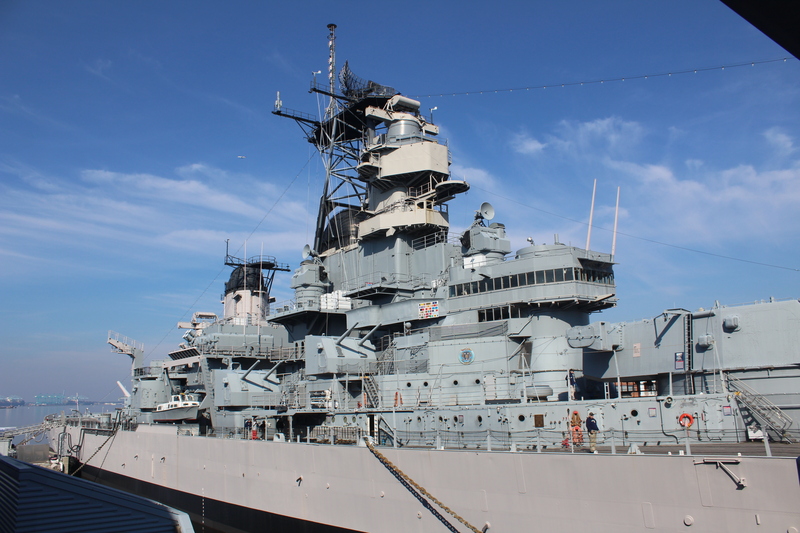 In 2009 all rights to the battleship were relinquished as it became apparent that $500 million was needed to reactivate the aging vessel and $1.5 billion for full modernization. The battleship was then stripped of usable parts be used on other ships. 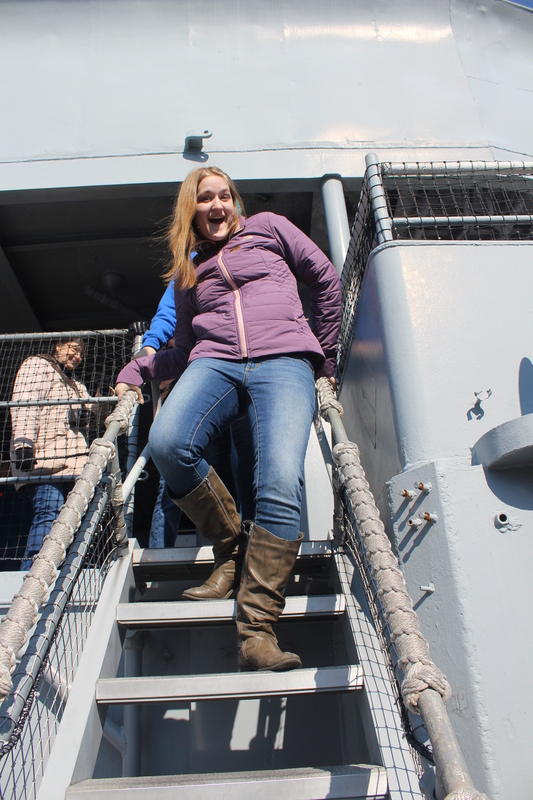 She fought with distinction in three wars and is now enjoying an honorable retirement as a tourist attraction. An interesting tidbit…. it cost $1 million a year to keep the Wissonsin in retirement. In her active days, it cost $1 million per day to maintain her duty. 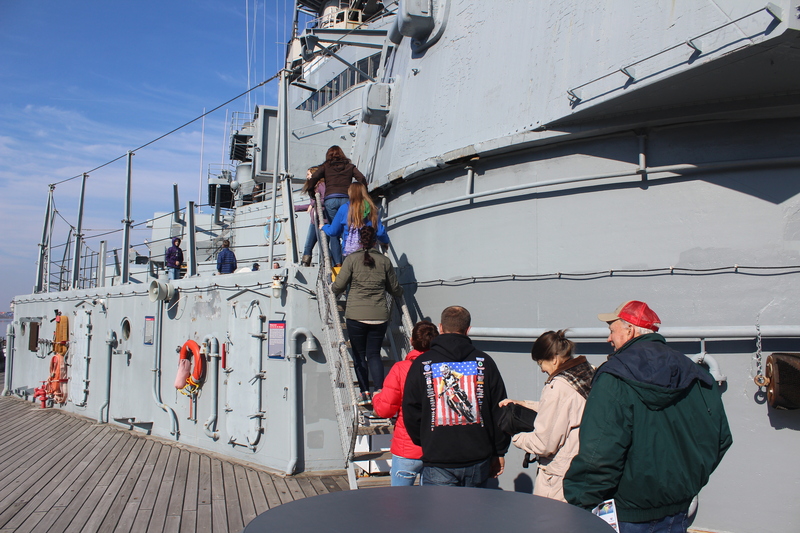 For Christmas this year, we gave our kids and grandkids an experience gift-a tour of the Battleship Wisconsin. 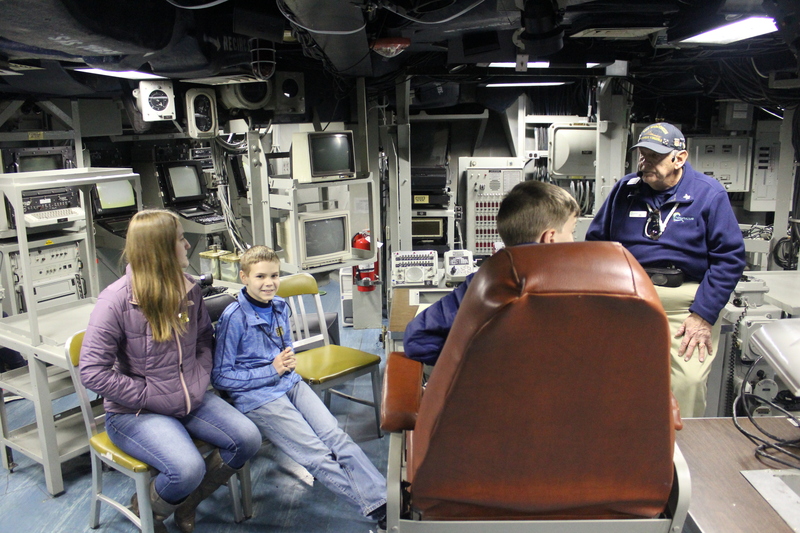 You can take a self-guided tour or take advantage of two guided tours: Command and Control Rooms and Engine Room. 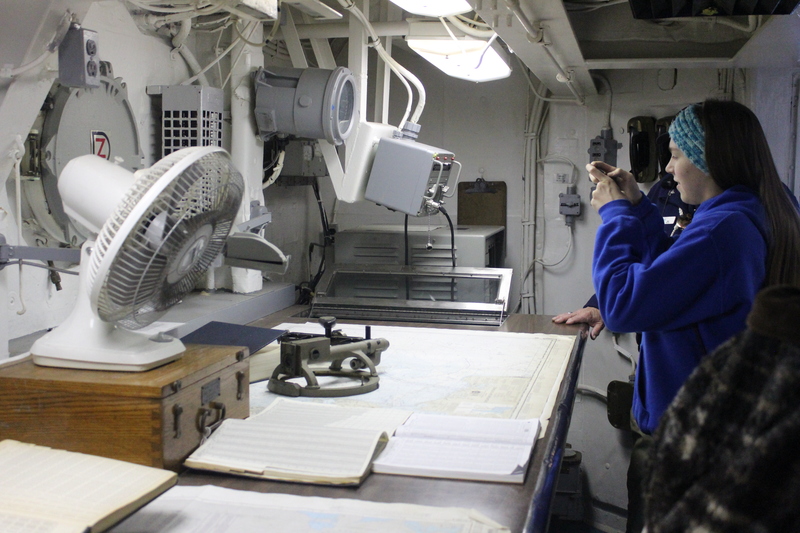 Command and Control Tour was a 90 minute tour that covered four “decks” and included the Captain’s cabin, Admiral’s cabin, Combat Engagement Center, Flag Bridge, navigation Bridge and Quartermaster’s space. 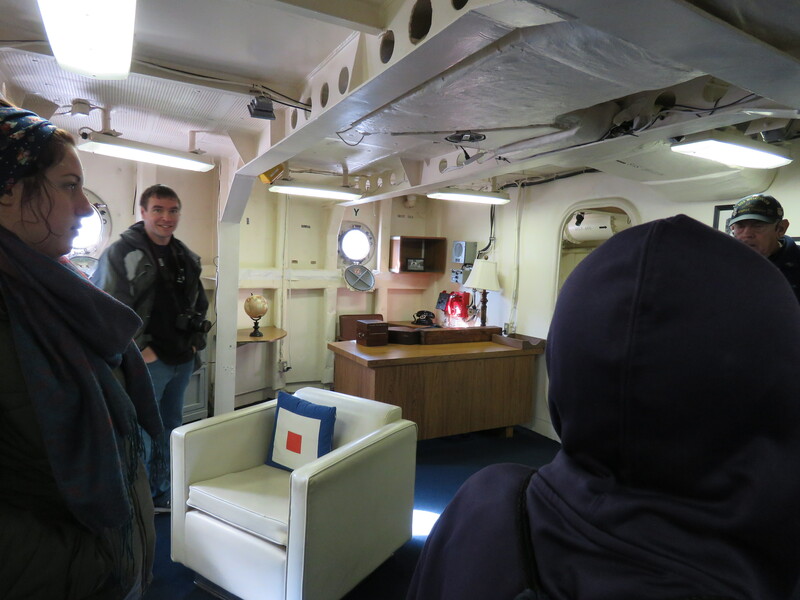 Here we are sitting around the table in the Captain’s cabin. 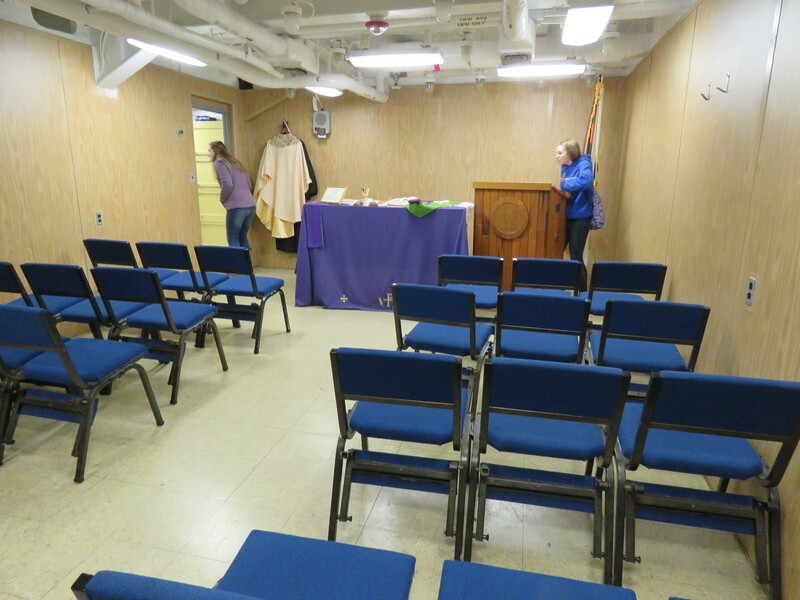 This was a very important place where meetings and decisions were made with some big name military personnel. Norman Schwarzkupf Jr. a United States Army General who was Commander of Central Command sat at this table. We just don’t know who sat in his chair! 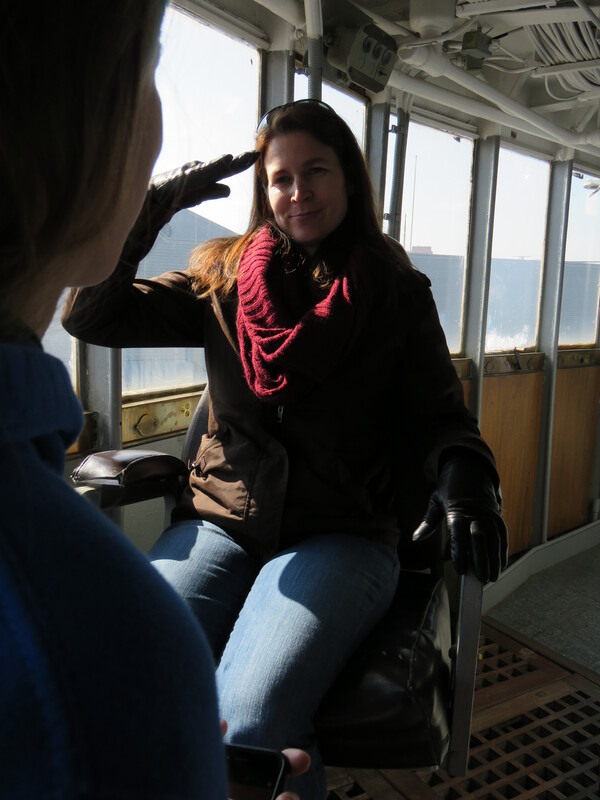 The captain is in command of the ship. No one can tell him what to do. He is the final word. 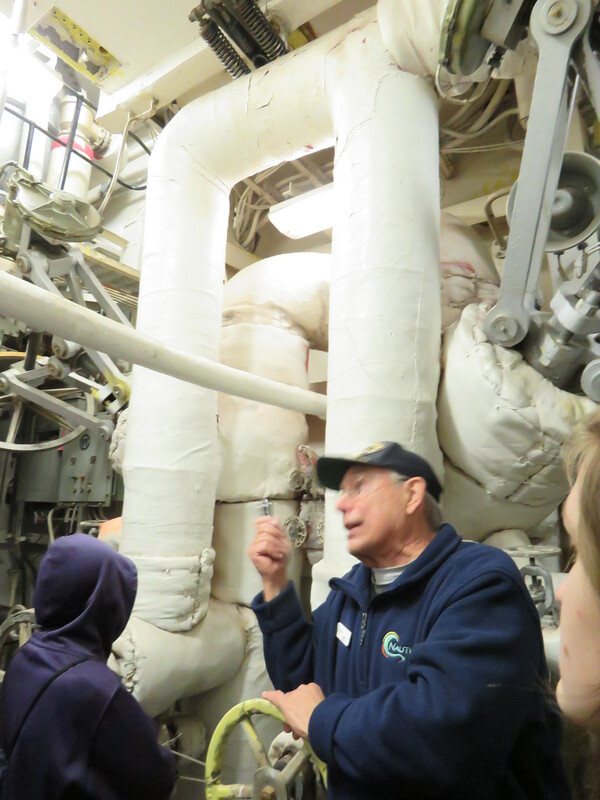 Our tour guide was well-versed as he had served on the ship. Those numbers are very important and these signs are posted everywhere. 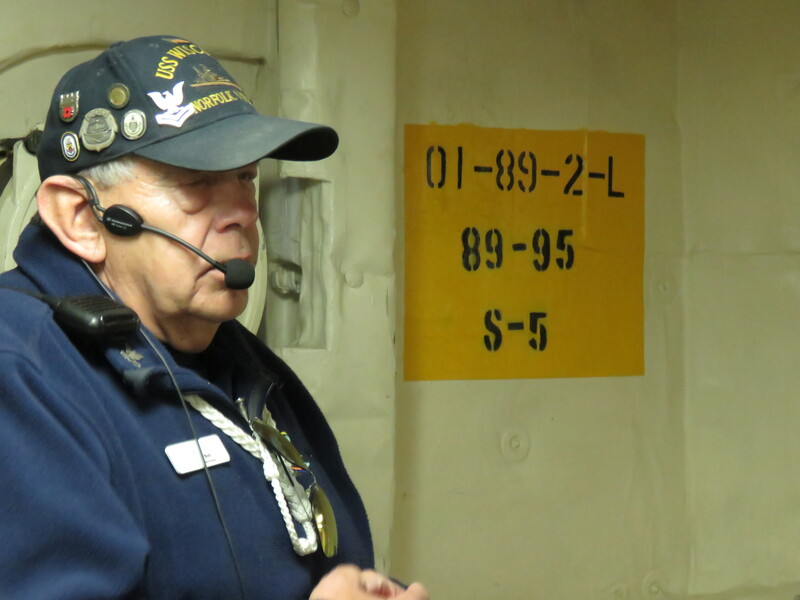 It tells emergency personnel the exact location of that room on the ship with each number or letter giving specific important information. I remember that the second row (89-95) refers to the numbers on the metal i-beams in the ceiling of the room. 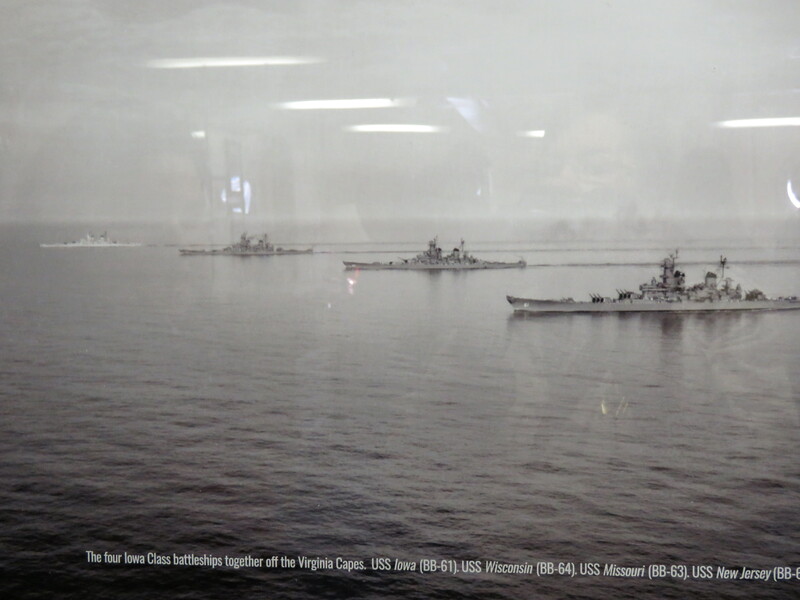 In the Captain Cabin is this photo of the Iowa, Wisconsin, Missouri and New Jersey Battleships at sea. 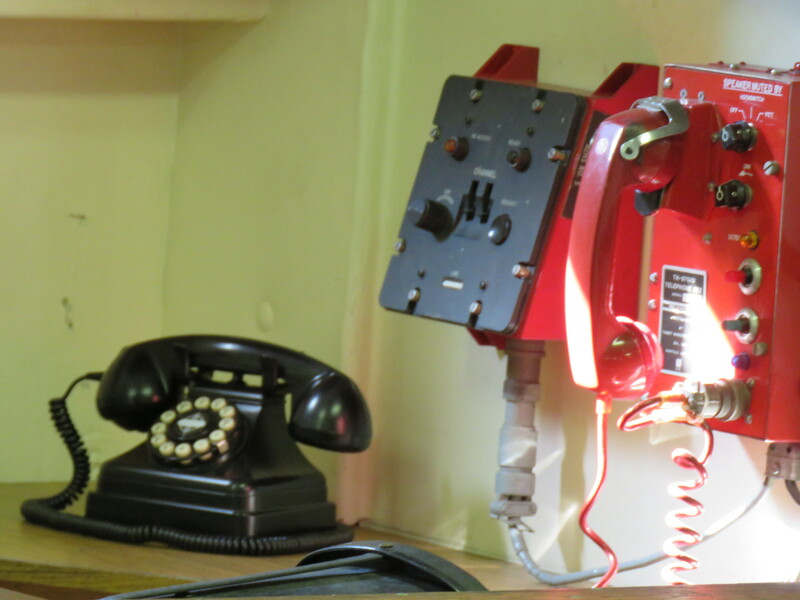 The Control room where commands are given to “fire”. The brown chair is the captains chair. A simulation of what it is like in that room during battle. 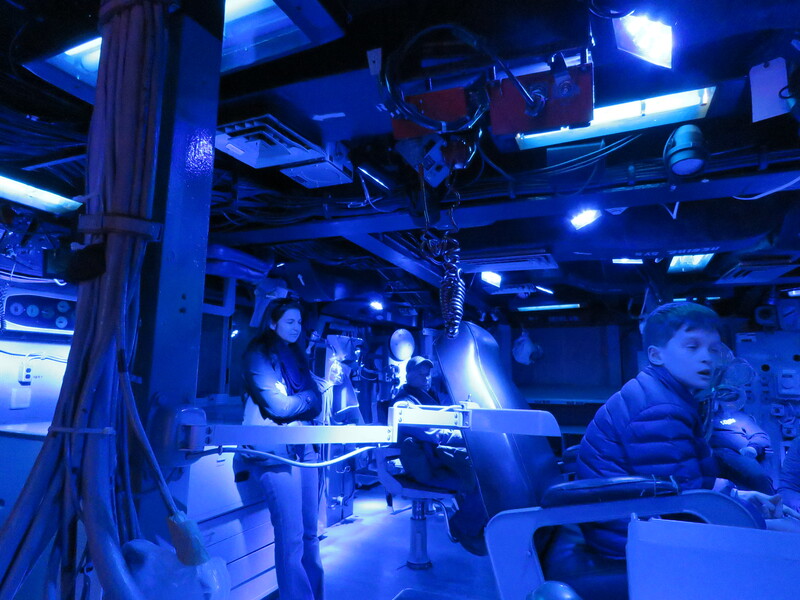 The blue light was used to produce a calming effect during the flashing lights, voice commands and intense release of firepower. Navigation Table where they mark and keep track of their location at all times. 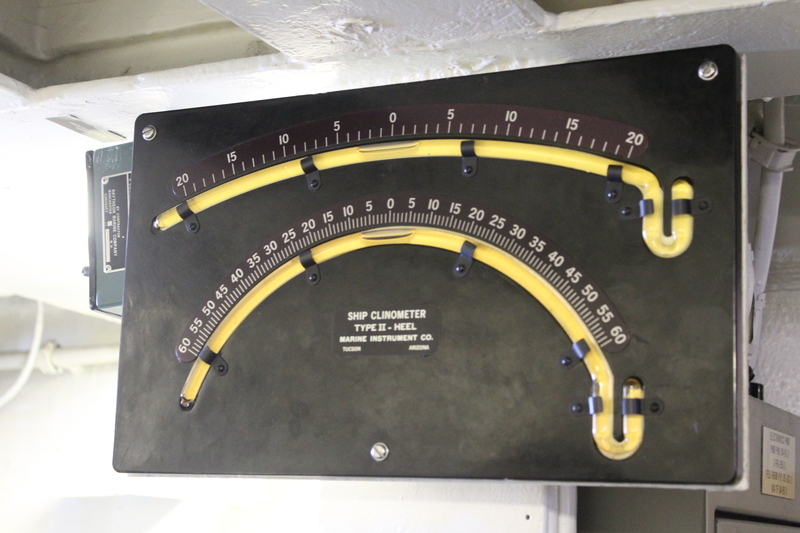 This bubbles on this Clinometer tells us that the ship is floating level. If the bubble was at the top of the U-shaped curl on the far right, we would be upside down-capsized and heading for the bottom of the sea! Incidentally, he said that divers always look for this meter as it tells them a lot about what happened. These steep ladders were everywhere. For some of us it was easier to go down backwards. And others preferred this way! 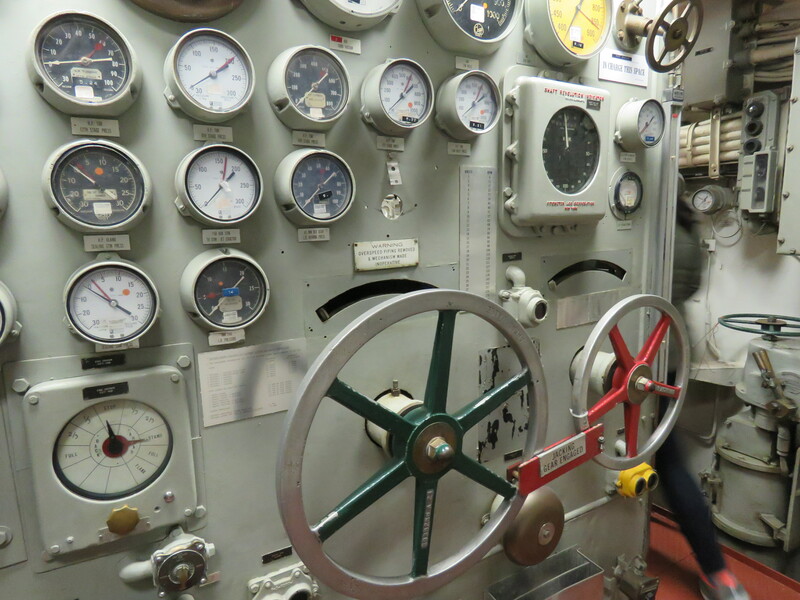 There were valves, levers, gauges, pipes, and equipment everywhere. 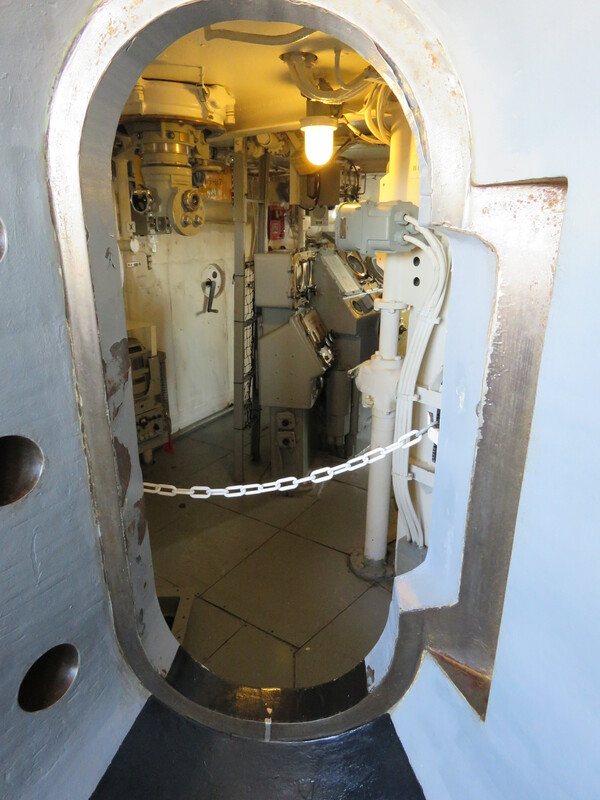 This door to the Control Room that is on top on the ship weighs 10,000 lbs. The solid steel and iron security was incredible. Attacking missiles can not penetrate it. Sometimes it just feels good to “be captain”!!! A view down a long walkway-over 300 feet. 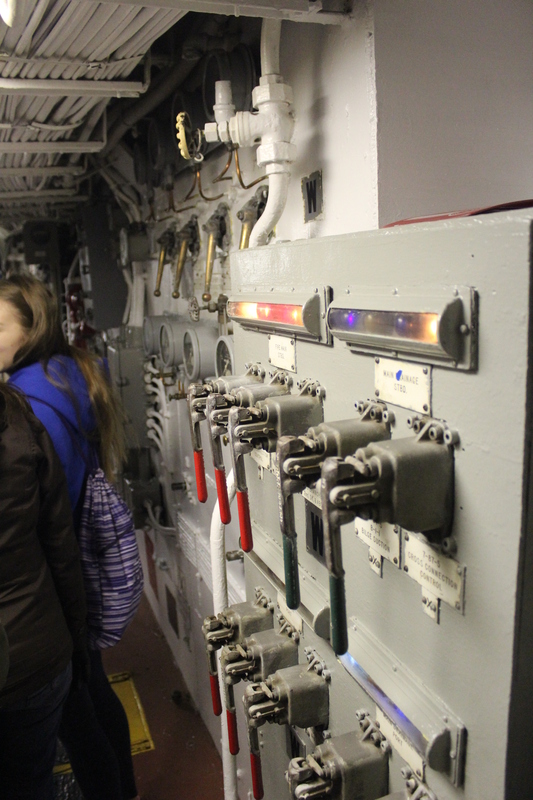 Engine Room Tour was a 60 minute that took us seven “decks” down in the depths of the Battleship Wisconsin, where we learned what was required to power this massive city at Sea. 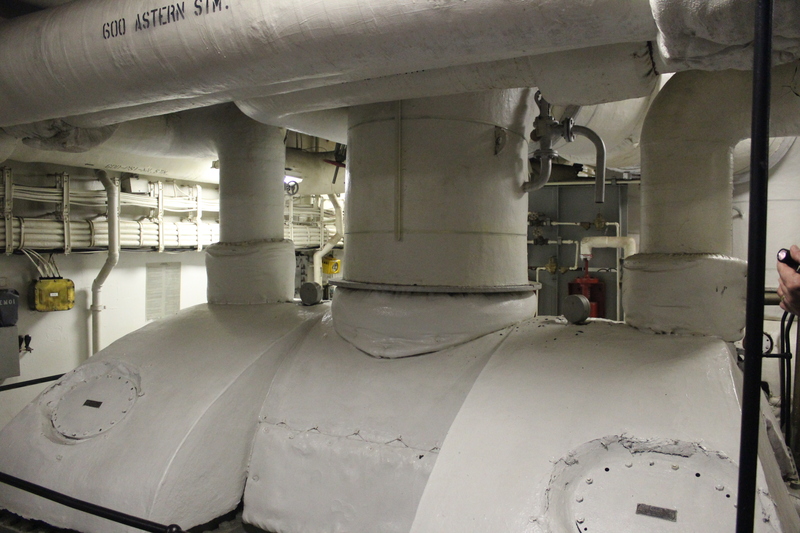 There were four engine rooms where huge broilers made steam to produce electricity and power the ship. 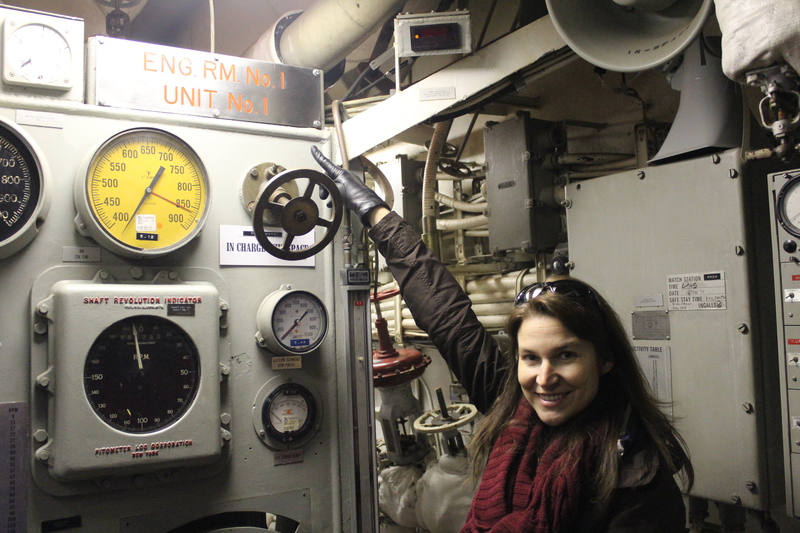 We were in Engine Room #1. 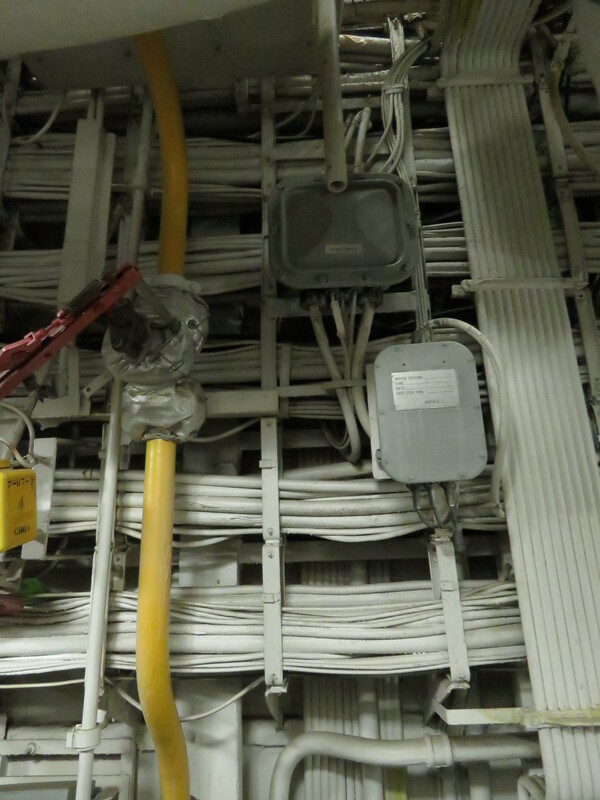 The organized maze of electrical wires and pipes was beyond comprehension. I can’t not fathom the engineer planning that went into producing such an incredible ship where everything fit, had it’s place and worked. And they knew what it all meant! 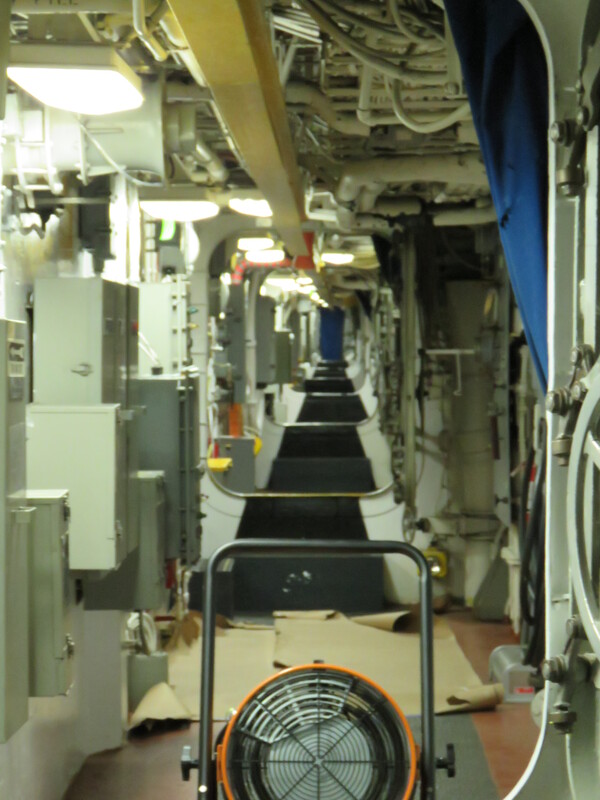 It was hard to get many pictures in the bowel of the ship. 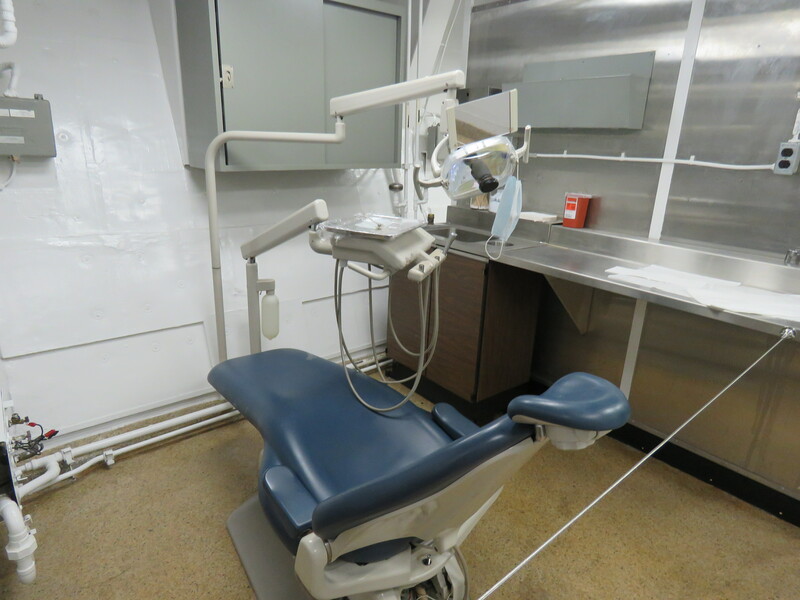 The spaces were so small and the equipment so huge. Some of these areas get so hot when in use because of the steam broilers. The men worked in 130 degree temperatures with 100% humidity and no air conditioning. They can only work four-hour watches. 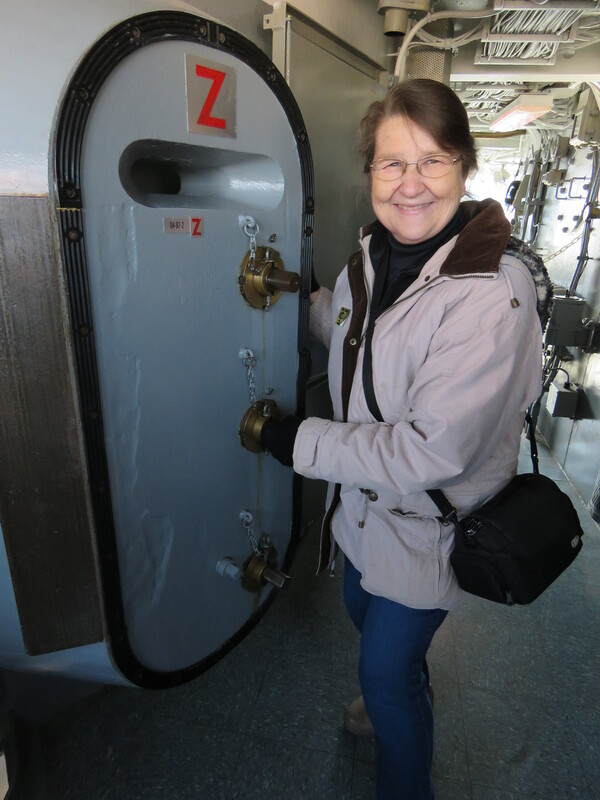 There was one room that had crucial gauges in it that would get up to 150 degrees. That is the limit a human body can stand and they can only be in that room 30 seconds. Two go in and quickly read the gauges and come back out. No one is allowed to go in alone. 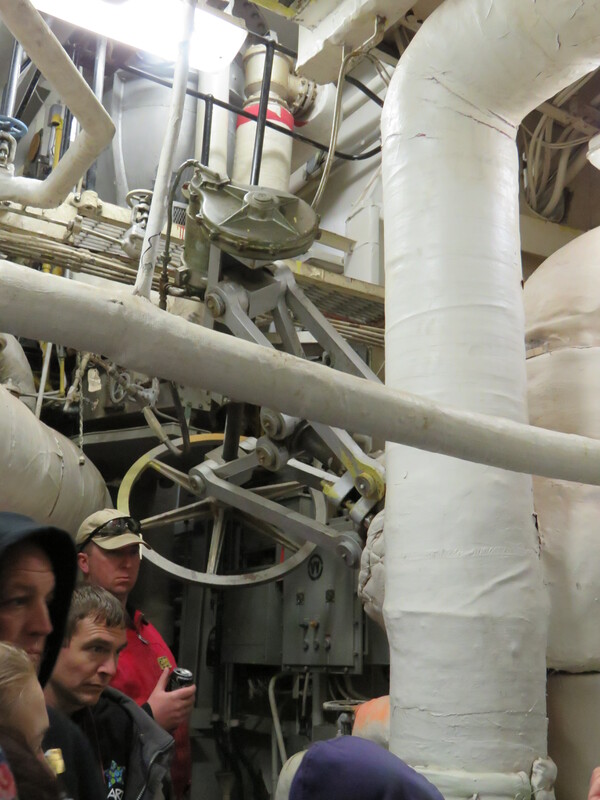 Some of the pipes are 800 plus degrees. You do not accidently touch them or you deeply regret the moment. 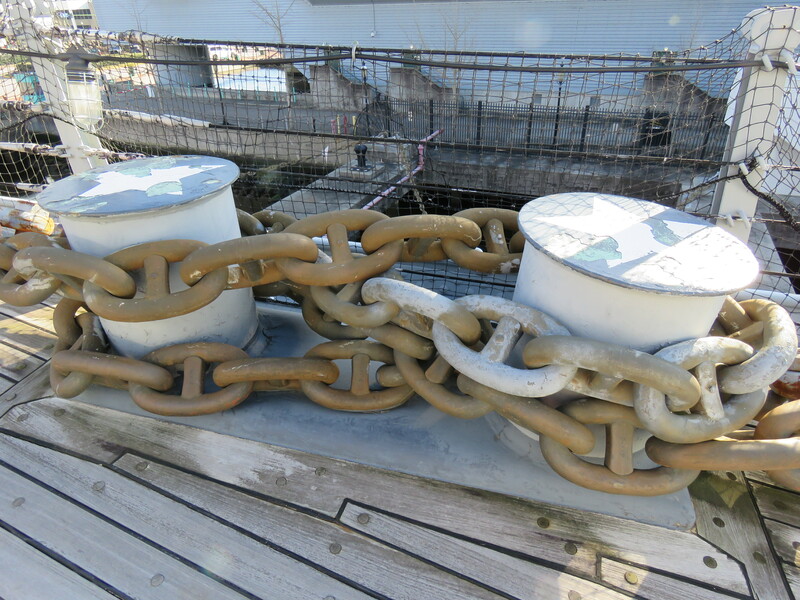 We were down seven decks and saw the bilge-the floor of the ship. We learned the ship has it’s own language: some examples. A destroyer always traveled with the battleship to help protect her from enemy attack and submarines. 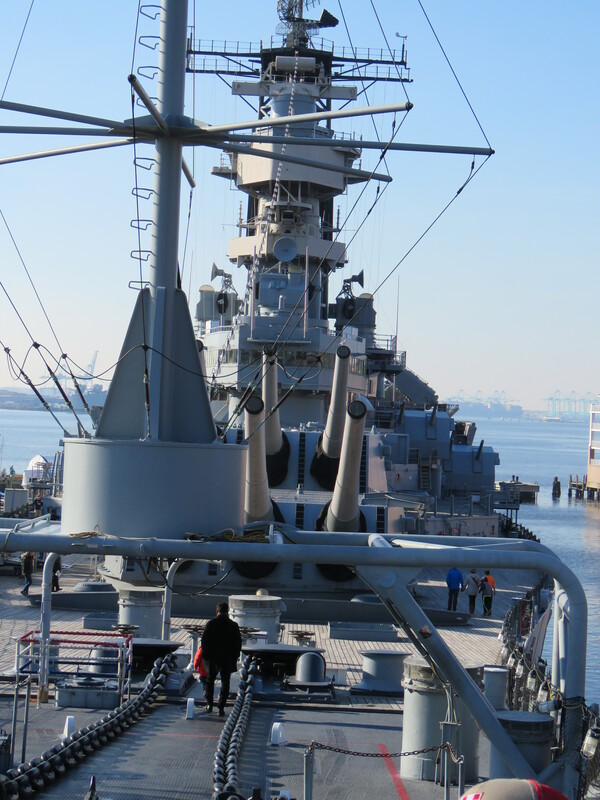 The battleship was incapable of detecting or destroying submarines. The destroyers were smaller, not as noisy, more agile and equipped with sonar equipment. 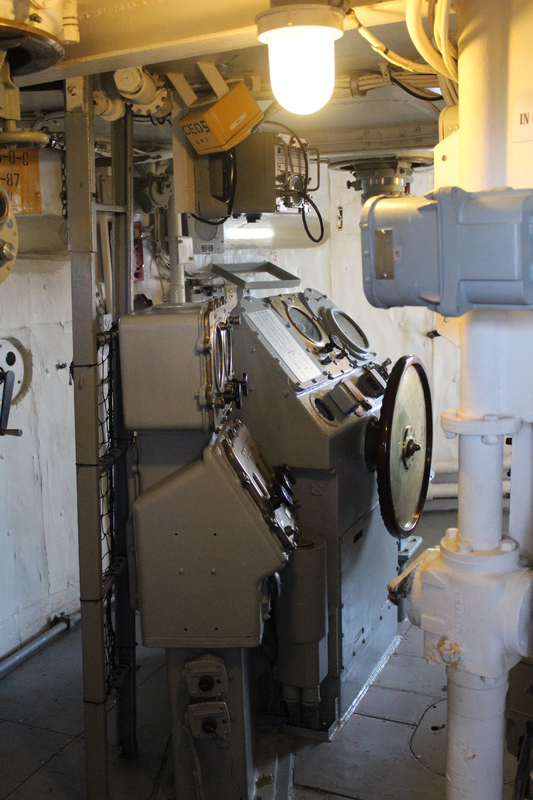 They told the story from several years ago, when a man was visiting and touring the ship, and he asked why they didn’t raise the hatch on the launcher so people could see what it looked like. They had to admit, no one knew how. 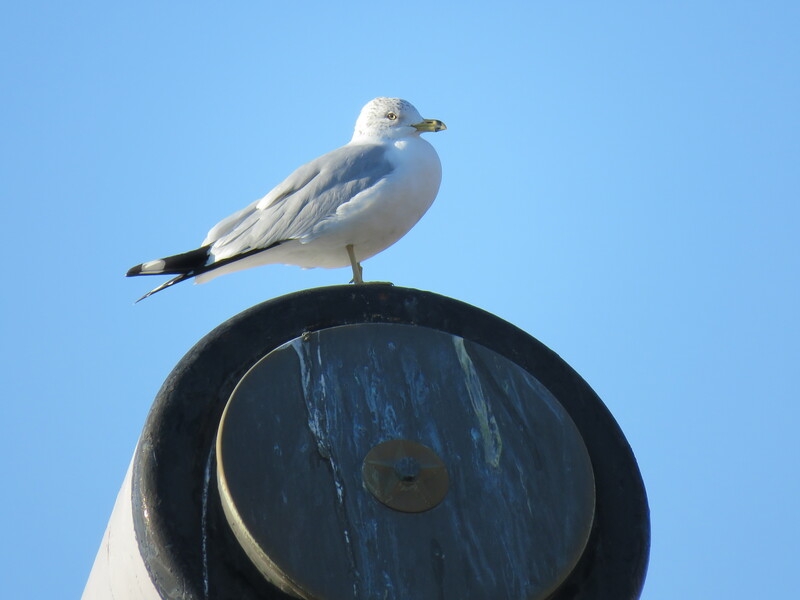 He said, “I did that job, I know how.” The next day the man returned and he took them to the right control, push the button, and the hatch raised. 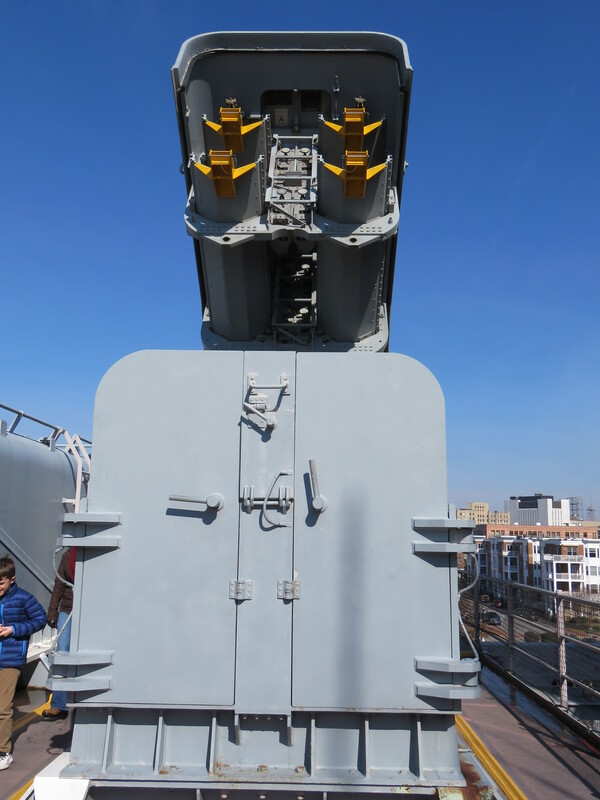 The fire-power of this ship, the accuracy it could hit and the distance the missiles could go was fearsome and state of the art. 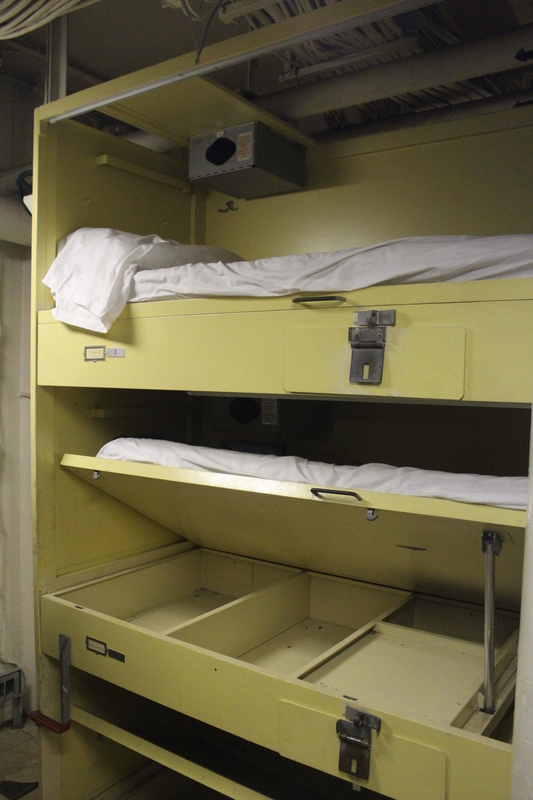 Berths were stuck in every available nook. Several times during the day we were referred to as “the large family”. As we purchased our tickets, they became aware that this was our Christmas gift to the family. 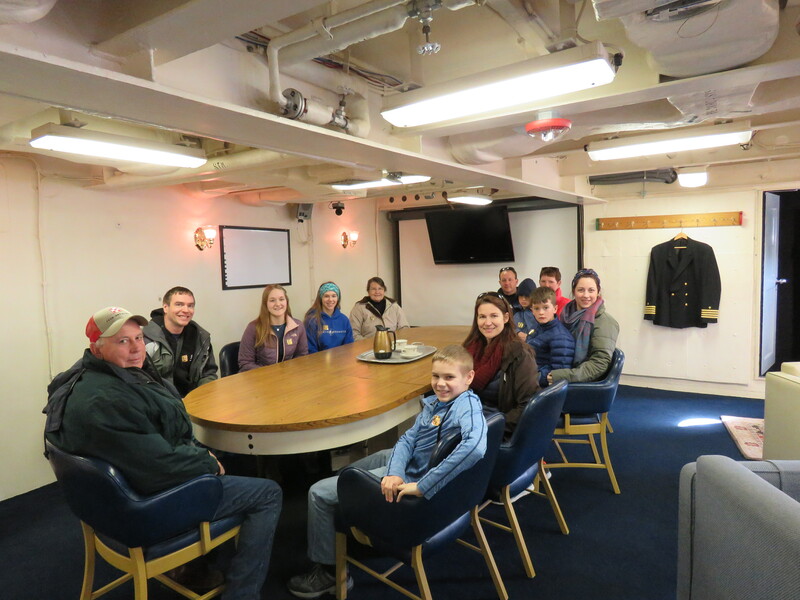 When we left the building, walked across the bridge to the ship where our tour guide was waiting for us, he said, “Are you the large family”? The word was passed around! When we were leaving in the late afternoon, one of the staff was standing by the door and wished us a “Merry Christmas”! That’s all awesome and mind-boggling, Pat. Thanks for sharing. Thoroughly enjoyed “the tour”.